Swept Path Analysis is very important for any Parking Site design. Parking sites usually aim to fit as many cars as possible within a limited space. Of course there should be enough room to safely drive around and get in and out of the car. Most parking sites tend to use all the space they have available. To maximize the amount of parking spaces on the total available area, vehicle swept path analysis is used. The size of the actual parking space is usually a standard size. These standard sizes can differ per country. The main calculations are done for the driving space. When designing a parking site the drafter wants to know how much space is required for a vehicle that steers into the parking place. Without enough turning space, one would simply not be able to reach the parking space or could hit other vehicles while trying to do so. A good parking site will make parking safe and easy while maximising the amount of cars that can be parked on the site. 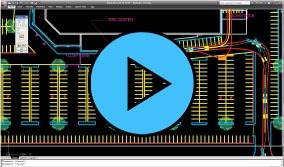 Watch a recorded webinar on Parking Site Design. If you are designing Parking Sites, take a look at ParkCAD™. Specialized parking site design software with advanced features.